"Ruth Doumlele´s re-creation of the 18th and 19th centuries reads as you-are-there, with all its glory and grandeur of great and familiar names and families, as well as the pettiness, anguish, sensitivity, and joy of mere mortals. We see the immortals and the not-so-immortals and the women who goaded them, supported them, caressed them, and sometimes betrayed them." "Luscious, saucy, straight-laced, vindictive, kind, brave--these are just a few of the adjectives that describe the Randolph women of Virginia. Richmond historian Ruth Doumlele has painted a rich, colorful portrait of these women and the times in which they lived." 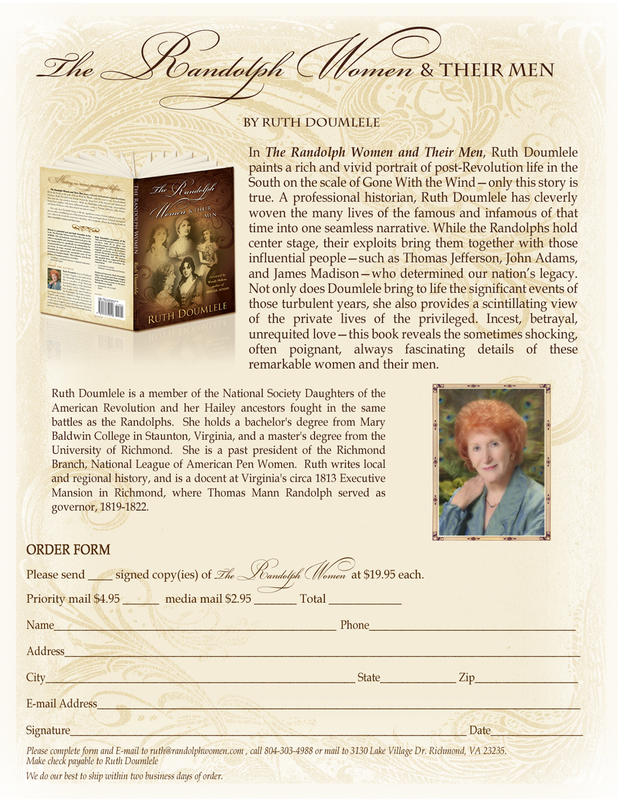 "Richmond historian Ruth Doumlele depicts the secrets and silent struggles of the strong Southern women of the Randolph family behind the men in power in the post Revolutionary South." "The Randolph Women and Their Men is an intimate view into pre- and post-Revolutionary America through the intricate relationships and political undertakings of a prominent Virginia family. The marriages of the Randolph family linked them to some of the most important people of their time. Meticulously researched, Doumlele's book conveys a real flavor of nascent political America, the realities of plantation life, the Austen-like position of women in American society and the machinations of a world based on letters and observations from visits. The most appealing character is the long-suffering Ann Cary Randolph, known as Nancy, whose trials and tribulations begin at the Virginia plantation known as Bizarre and extend to such faraway places as Rhode Island, Connecticut and New York. Those who take an interest in history, in women, in human relationships and in a well-told story will delight in this book." "The Randolph Women and Their Men brought history alive for me. The intimate details offered every step of the way drew me into the very essence of what life was like in the pre and post Revolutionary America. Ruth Doumlele has done more than just present facts and dates - she has presented us with names and then brought them to life with details that only years of dedicated research could have assembled. Not only does she awaken history but stirs within us the desire to know more about the times and the people. She portrays such a fascinating fabric of the time you really care about the individuals and what befell them. This book has given me a new appreciation of the time, the amazing women who survived it with strength in a time it wasn't easy being a woman, and what life was really like not so very long ago. "I recommend this book to anyone who has a genuine interest in knowing what life was really like in those times of coming into maturity for not only as a nation but as strong individuals as well. You'll find yourself coming away with greater respect for those who laid the foundations for what we today take for granted and for the women who helped it all happen."